The Secretary, Department of Space, Chairman, Space Commission and Chairman, Indian Space Research Organisation (ISRO), Shri A.S. Kiran Kumar addressing at the Valedictory Session of the International Seminar on Indian Space Programme titled Trends and Opportunities for Industry, in New Delhi on November 21, 2017. New Delhi: The International Seminar on Indian Space Programme: ‘Trends and Opportunities for Industry’ was concluded here today. The seminar was organised by Indian Space Research Organisation (ISRO), Antrix Corporation Limited (the commercial arm of ISRO), in coordination with Federation of Indian Chambers of Commerce and Industry (FICCI). During the seminar, the stakeholders from industry, policy makers, thought leaders and academia, held discussions on the enabling and encouraging policies of Government of India to exploit the commercial space segment by Indian Industry targeting both domestic and international market. Speaking on the occasion, the Secretary, Department of Space, Chairman Space Commission and Chairman Indian Space Research Organisation (ISRO), Shri A S Kiran Kumar said that India has set new benchmarks in the era of space technology in various areas such as Space Application development, Space science, Satellite sub-system co-creation and Space Infrastructure. He said that the seminar acted as an enabler in encouraging India to explore potential for International collaboration with key space agencies in the value chain of Space Sector. He expressed that Space technology has immense potential in space exploration, joint ventures of collaboration in assembly and integration of satellite sub-system, cluster development, knowledge and information dissemination, launch infrastructure co-development, ISRO’s versatile workhorse PSLV launch vehicle integration and communication and navigation satellite creative co-creation opportunities, among others. While giving his valedictory address, Foreign Secretary, Dr. S Jaishankar said that the space sector has come of age with rapid strides in PSLV, GSLV and GSLV Mark III and having potential in economic growth and development of the country. He said that India is proud of its space sector achievements. He enlisted the reasons for the need and the requirement for development in capability augmentation and capacity building, be it, in Space application, Satellite based mobile technology, Telemedicine and disaster management to name a few. He emphasized that overcoming the challenges in this sector, the need to arrive at a global consensus on various issues like peaceful use of outer space for space exploration rather than struggle for earth outer space with competitive attitude in global arena among countries. He discouraged the use of space for weaponization purpose and development of arms mantle around the space. He said that Industry, Government and Entrepreneurs have to work in tandem to realize the Prime Minister Shri Narendra Modi’s vision of ‘Leaving no space between Common Man and Space’. He said endeavour should be for holistic development of common man, so that the advantages of Space development reaches the last mile. He said that the recent launch of South Asia Satellite is a matter of pride and reflects neighbourhood first policy of India. The seminar was inaugurated yesterday. The two-day seminar included sessions on Space Industry Ecosystem: Role and Opportunities for Industry, Leveraging Public-Private Partnership for Indian Space Programs, Capacity building and talent management and panel discussion on role of industry in Indian Space Program. Eminent speakers included Dr M Annadurai, Director, ISRO Satellite Centre (Bangalore), Dr P G Diwakar, Scientific Secretary, ISRO, Dr K. Sivan, Director, Vikram Sarabhai Space Centre, Shri S. Somnath, Director, Liquid Propulsion Systems Centre, Shri P. Kunhikrishnan, Director, Satish Dhawan Space Centre, Dr V K Saraswat, Member, NITI Aayog, Dr B N Suresh, Distinguished Professor, ISRO, Dr. Y V N Krishnamurthy, Director, National Remote Sensing Centre and Dr. Kumar Krishen, Professor, University of Houston, USA. In the industry session, during the opening address Dr. Annadurai, Director ISRO Satellite Centre laid stress on role of space technology in achieving sustainable development goals, disaster management and improving important governance objectives. He also stressed on the role of the private sector in expanding the space industry stating that while a good number of industry partners with ISRO already, however, this needs to increase as we are working on launching 18-20 satellites per year. Dr. V K Saraswat, Member, NITI Aayog chaired panel for the session on ‘Capacity Building and Talent Management’. The session skewed towards members of the academic community and they discussed the current challenges and the way ahead. He said that the need of the hour is to be more aggressive about developing the space department and expanding the capabilities of the industry. Dr. Swaroop Ganguly form IIT Bombay said, “Strengthen the consortia of ISRO, academia & industry for capacity building”. However, they also agreed that after attracting the youth to the space sector, either in Academia or Industry, retaining talent pool posed challenges of its own. Speaking on the issue, Dr. Steven D Jolly, Director and Chief Engineer Lockheed Martin Space systems Company, said that the most important thing to be considered is how to unlock the youth talent pool. Mr. Jonathan Hung, President Singapore Space Technology Association (SSTA) spoke on how Singapore is trying to involve the youth in taking an interest in space research, noting that space technology is not science fiction anymore and youth can actually engage with these technologies. Dr. Kumar Krishnen, Professor from University of Houston, USA however was confident that regardless of the challenges, humanity is not going to stop exploring. 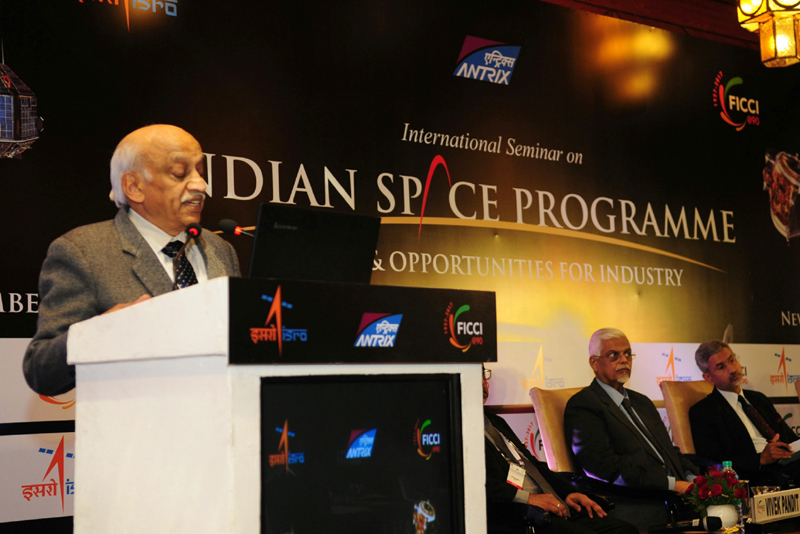 The next session on the Role of Industry in Indian Space Programme was chaired by Mr. S Rakesh, Chairman Antrix Corp. The session covered a wide range of topics on the role of Industry-academia-Scientific Community to meet the emerging challenges and requirements of the space industry. Col H S Shankar, VSM (Retd) stated that it is time industry develops its own R&D facilities to enable technology transfer, strongly pitching that the industry needs to shift to a self-reliant system. Dr. Suraj Rawal, Technical fellow, Lockheed Martin Space, said companies who have delivered cutting edge innovative technologies, are looking forward to partner with the Indian industry to deliver solutions for the emerging needs of ISRO. Mr Jonathan Hung said that collaborations with various chambers of industry association is a great step for the space technology while discussing international industrial cooperation in space. However, Dr. Amal Chandran said that there is a need for collaboration with industry for research based innovation on industry academia international collaboration. Speaking on emerging trend on space diplomacy, Lt. Col Ratan Shrivastava said that space diplomacy has to find its way into the diplomatic efforts of the national as space truly has no boundaries and shared resources of space infra can lead to common good of humanity. The prognosis for Indian industry looks particularly bright with the immense benefits emanating from a developed space ecosystem which directly augment such widely impacting sectors such as Telecommunications, GIS, Agriculture, Meteorology, Mining and Natural resource conservation. This further translates towards creation of a huge pool of high value-high wage jobs in various advanced technology sectors. The event saw the participation of key players from ISRO, the Indian space industry, military service, DIPP and international agencies.